[tps_footer]After knocking the doors of Bombay High Court and after going through all the odds, Shahid Kapoor, Alia Bhatt, Kareena Kapoor Khan and Diljit Dosanjh starrer Udta Punjab got released today on June 17. Unfortunately, two days before the release of the film, a copy of the film with ‘For Censor’ watermark got leaked online. The film with a running time of 2 hours and 20 minutes made its way to the Internet. Soon after the news broke out, it created a stir on the Internet. From producers Ekta Kapoor, Anurag Kashyap to the entire Bollywood fraternity took to twitter to appeal everyone that they should watch the film in theatres and not the pirated version. The entire fraternity came together and expressed how much makers of the film put their efforts to make a film and that everyone should watch the film only in theatres. 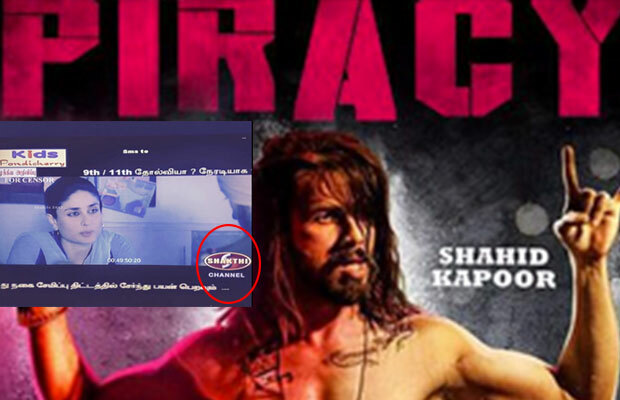 Well, we all know the industry is fighting with piracy since a very long time and it is very saddening that the film has been leaked online two days before its release. 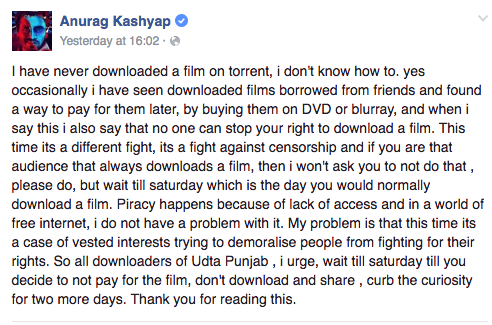 Anurag Kashyap also shared a post on Facebook requesting everyone to wait until Saturday before downloading the film from Internet. However, in the shocking turn of events, Puducherry-based local cable channel Shakthi TV has already aired the entire copy of the film. Yes, that has happened and it’s disgusting.